After the success of the Kobe 8 “Mambacurial”, Nike is releasing the LeBron counterpart. 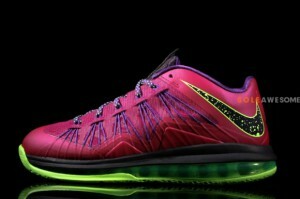 Inspired by the Nike Mercurial Vapor IX Fireberry – Electric Lime the LeBronacurial sports a Raspberry Red – Blueprint – Court Purple colorway. Expect the LeBronacurial to drop 9/7 for $160 at most Nike retailers.